This chapter examines how Sorensen’s influence over Kennedy’s Senate career increased during the late 1950s. It details his importance to the Senator’s intellectual development. 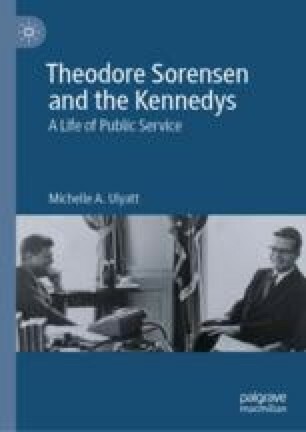 The chapter highlights the mishandling of Kennedy’s response to moves to censure Senator Joseph McCarthy as an early blot on Sorensen’s record. It then examines the work he did with Kennedy to restore his political credentials through their collaboration on the Pulitzer Prize-winning book, Profiles in Courage. Ulyatt argues that the book was the first expression of their shared concept of public service. Finally, the chapter details how the four-year speaking tour that Kennedy then embarked on helped strengthen his relationship with Sorensen and laid the foundations for the Senator’s presidential campaign in 1960. Bundy, McGeorge. 1964. Interview by Richard Neustadt. John F. Kennedy Library Oral History Program, March and May 1964. https://docs.google.com/viewerng/viewer?https://archive1.jfklibrary.org/JFKOH/Bundy,+McGeorge/JFKOH-MGB-01/JFKOH-MGB-01-TR.pdf. ———. 1956. “Remarks by Senator John F. Kennedy at the Democratic National Convention, Conrad Hilton, Chicago, Illinois, August 16, 1956.” John F. Kennedy Presidential Library and Museum. https://www.jfklibrary.org/Research/Research-Aids/JFK-Speeches/Chicago-IL-Democratic-National-Convention_19560816.aspx. Woolley, John, and Gerhard Peters. n.d. “1956 Democratic Party Platform, August 13, 1956.” The American Presidency Project. Accessed August 30, 2018. http://www.presidency.ucsb.edu/ws/index.php?pid=29601.